I'm a tree hugger of the practical, utilitarian variety. I like to conserve energy, and by far the biggest energy sucker in my house is the windows. I've finally done something about it. 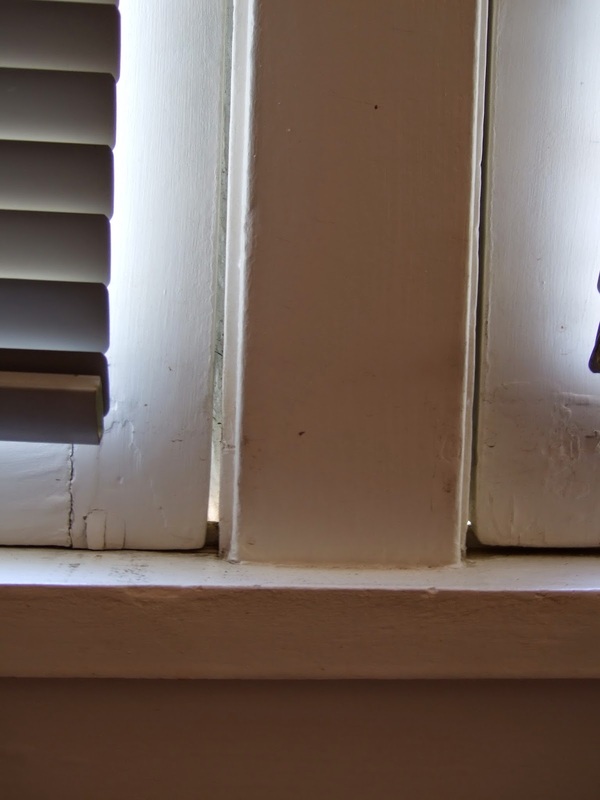 This post is all about how to weather-seal weird old-fashioned casement windows. There are a lot of different kinds of windows! Double-hung sash windows (with a top and bottom part which can be slid up and down within the frame) are common in the US. My kitchen and bathroom have double-hung sash windows which I'll write about another time. The two ad-ons on the back of my house have newer (rather shoddy) sideways sliding horizontal sash windows, and the kitchen has two newer tall fixed windows that go into the laundry room (kind of odd). 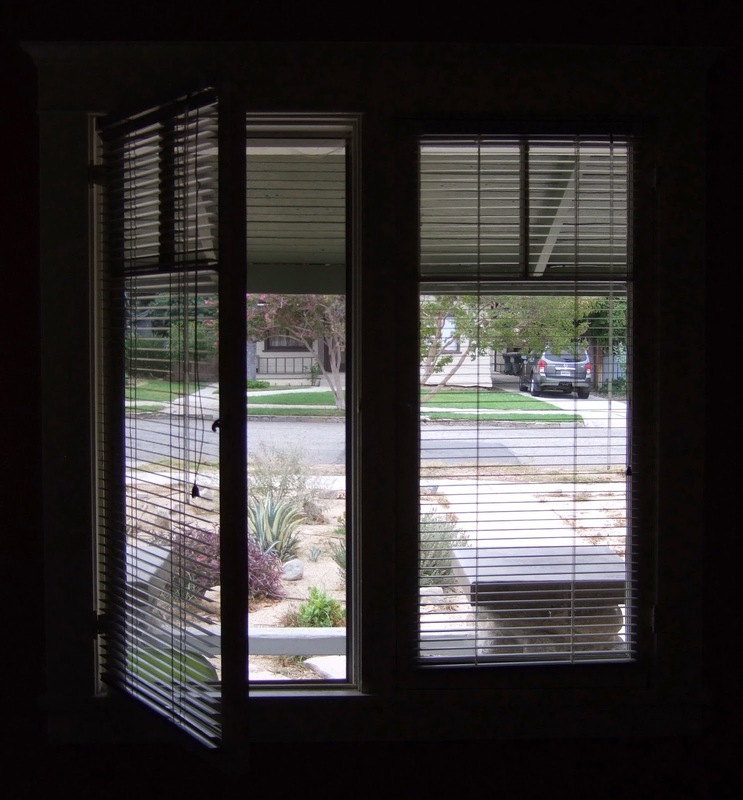 However, the vast majority of my house's windows, however, are inward-swinging casement windows. They're quite elegant and reasonably easy to open and shut. The main disadvantage is that if you plan to open them often (which I do), you can't place any furniture within a few feet of the windows, which makes furniture placement rather awkward. Because they're nearly 100 years old, my windows have had plenty of time to settle and be rejiggered during earthquakes. They've also been painted at least 8 times. Consequently, the gaps around the windows are uneven, very tight in some places, and very large in others. This makes weather sealing difficult. 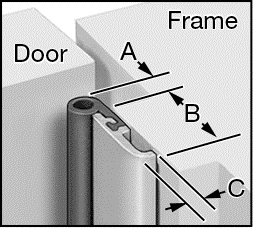 Some weather stripping and sealing products are designed to fit inside the gap and cracks. This class of products wouldn't work well on my windows because of the unevenness of the gaps. Someone in the past tried to put stick-on foam weather stripping on one of the living room windows, but by the time I bought the house, it was a sticky, oozy, squishy mess that actually prevented the window from shutting and latching all the way. Additionally, most of the stick-on foam or vinyl products I found tend to be short-term solutions that have to be replaced often. Finally, because the windows swing inward, they rub the frames sideways, and if you put weather stripping on the sides of the frame, the window will rub it sideways and tear it off rather than gently compressing it the way it's supposed to. In short, I had to start thinking about my windows like doors. Enter the compressible bulb seal! The diagram below from the McMaster-Carr catalog illustrates how it works. 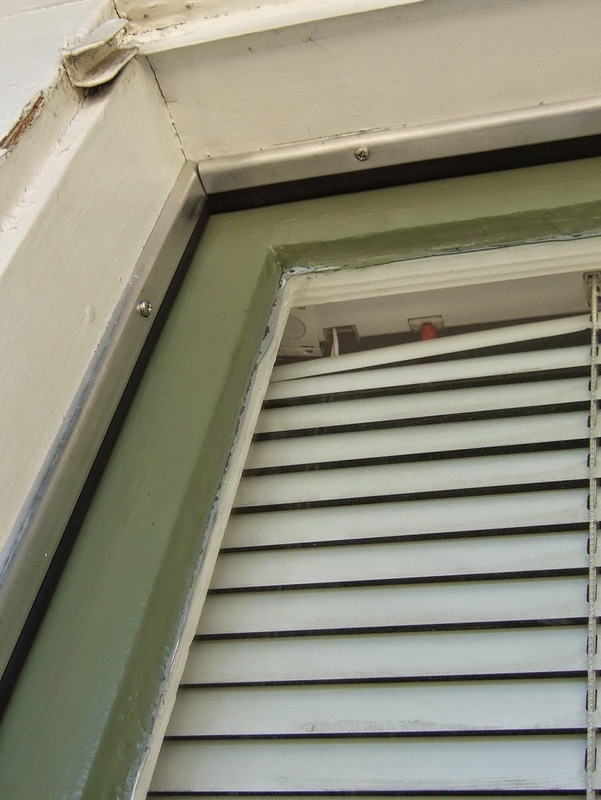 When the window shuts, it hits the rubber bulb and gently compresses it, forming a nice seal outside the crack, even when the window surface is a bit uneven. The bulb seals the crack from the outside, without having to fit in between the frame and the window. I looked into a few different options for compressible bulb seal weather stripping. I first tried some cheap stuff from Home Depot that had to be nailed, stapled, or glued on. Nails didn't work at all because the stuff bunched up and left gaps. I tried glue, but it was too hard to get it to set in the right place for a good seal. Plus, glue means it sticks to the paint and not the actual window frame, and it comes off as soon as the paint starts chipping. Finally, I decided to go with the product pictured above from industrial parts supplier McMaster-Carr (Frame-Mount Weatherstripping, Black Silicone Compressible-Bulb Seal, product number 1114A3, in case you want to buy some). At $2/foot, it was a lot more expensive than most of the weather sealing products out there, but I decided it was worth it. You get what you pay for. The seal comes in a nice aluminum flange that you can screw into the window frames. The flange compresses the edge of the bulb seal to the frame of the window, so air can't get around the fixed side of the bulb. Also, because they're screw-mounted, they're easy to take off and put back on if you want to refinish your windows (something I know I'll have to do in a few years, which will be an ordeal because they have lead paint on them). The catalog claims the silicone bulb is heat and UV resistant, which is important in this harsh climate. And, if it starts to go bad, McMaster-Carr sells replacement seals. Unfortunately, because it's designed mainly for doors, the stuff is sold in lengths that weren't optimal for my windows, so I had to buy extra and cut it down, which further added to the cost. Also, while I really like McMaster-Carr's catalog and customer service, their shipping is exorbitant. I called to get a shipping estimate, and they said $15, so I decided it wasn't worth the hour drive to pick it up at the warehouse in LA. However, they shipped it to me in three packages, each of which was $15. Sheesh! Note to self: always pick up McMaster-Carr orders at the warehouse in person. I cut the aluminum flanges to the correct lengths using my handy little jigsaw, a tiring procedure which used up three saw blades and made my hand and arm very tired. After that, I installed it in the window frames. It took me about 45 minutes per window. As of this writing, I've done 7 windows and the front door, and I have 6 more windows to go. I'm just waiting for cooler weather. I have discovered that I'm very bad at using a drill with my left hand. I sheered off one of my drill bits while trying to drill a pilot hole. It will probably remain stuck in the window frame forever, fodder for some future house archaeologist's blog posts. Speaking of house archaeology and sticky, oozy, squishy messes, I have one window that's pretty well stuck shut. To get it open, you have to yank a little from the inside and then bang on it from the outside. Upon examining it more closely, I realized that it is actually already weather-sealed with and compressible bulb seal that was subsequently painted over very thoroughly. In fact, this is why the windows ticks. 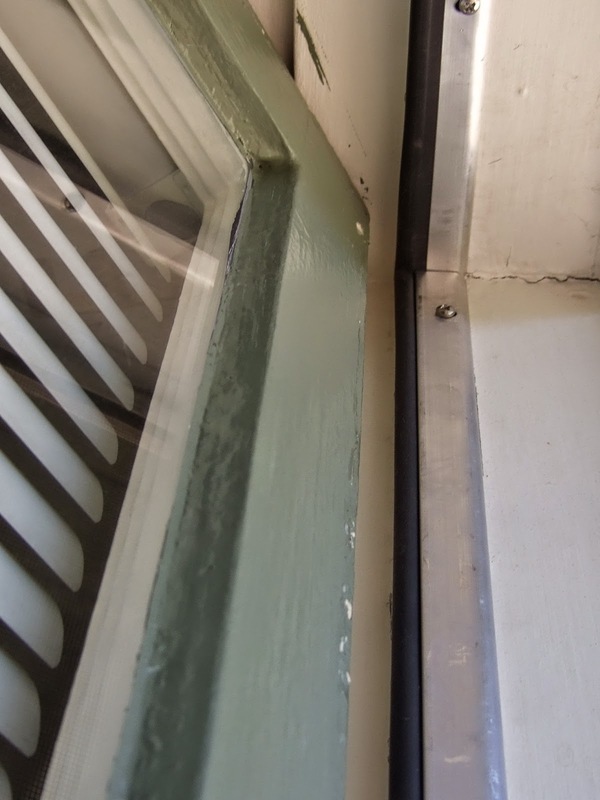 When the previous owner painted, she first painted over the weather stripping. Then, when she painted the window itself, she didn't wait long enough for the paint to dry before closing it, and the rubbery weather sealing bulb and the latex paint all got glued together. I can't wait to try to get that off. I'm saving that window for last. Public service announcement: Don't paint over your weather seal. Or your window hardware. Or your outlet covers, doorknobs, or anything else. Screwdrivers and painter's tape are your friends. With the windows closed, approach the window from the outside and place the top piece where you want it, mark the center hole, and trace the edge. You don't need to compress the bulb too tightly, but it should be snug against the surface of the window. Go back inside. Drill the center pilot hole for the top piece using the mark you made and then place the weather strip and screw it in loosely. Now that the top piece is in place, you can line it up just right and drill the pilot holes for the other holes in the flange, and screw it in. Sometimes you have to hang onto it pretty tight to avoid slippage when the screw heads hit the flange. With the top in place, line up each side piece and mark the location of the top-most hole. Take them down and drill the pilot holes for the top holes, and then screw them in using the top hole only, leaving them a bit loose. Now that the side strips are hanging loosely in the frames, drill the rest of the pilot holes, and then add the screws, making sure the strip remains aligned where you marked it. Try opening and shutting the window. Make sure it’s not too tight to shut, and go outside and look to make sure you haven’t left a large gap anywhere. It’s quite adjustable, and you will probably have to adjust it. You can loosen one or two screws at a time and rejigger it as necessary. If you're doing a piece along the bottom, do that now. I couldn't do the bottoms of my windows because the geometry is different. That's a project for another day.